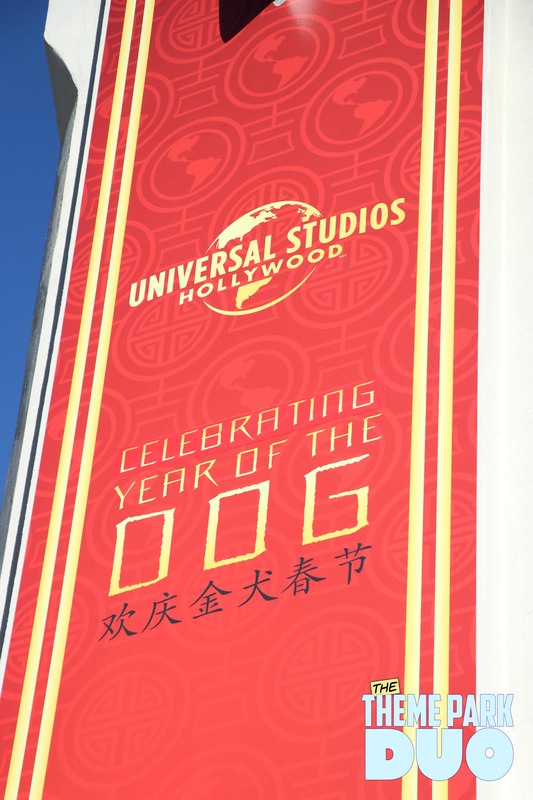 Universal Studios Hollywood and The Year of the Dog! 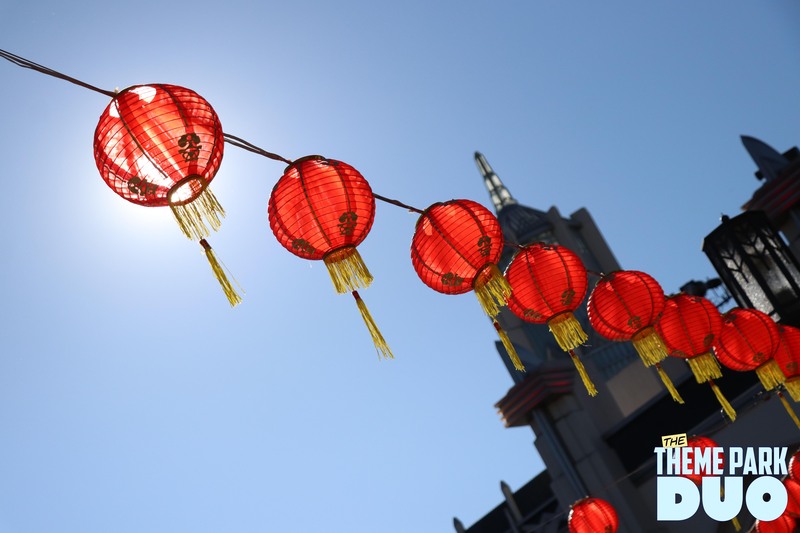 In the United States, Lunar New Year isn’t very prominent. At least not as prominent as it is in Asian countries. But any chance to educate the masses on different cultures should be taken. 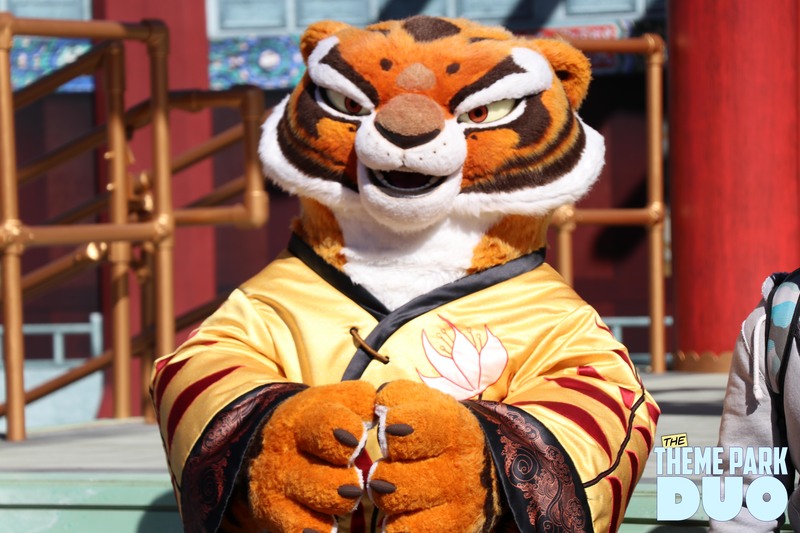 So heading into Universal Studios for their Lunar New Year event, I was excited to see how the Universal Creative team combines their Intellectual Proprieties of Kung Fu Panda with The Lunar New Year! As you approach the entrance to the park, there are red lanterns hanging underneath the main arch. 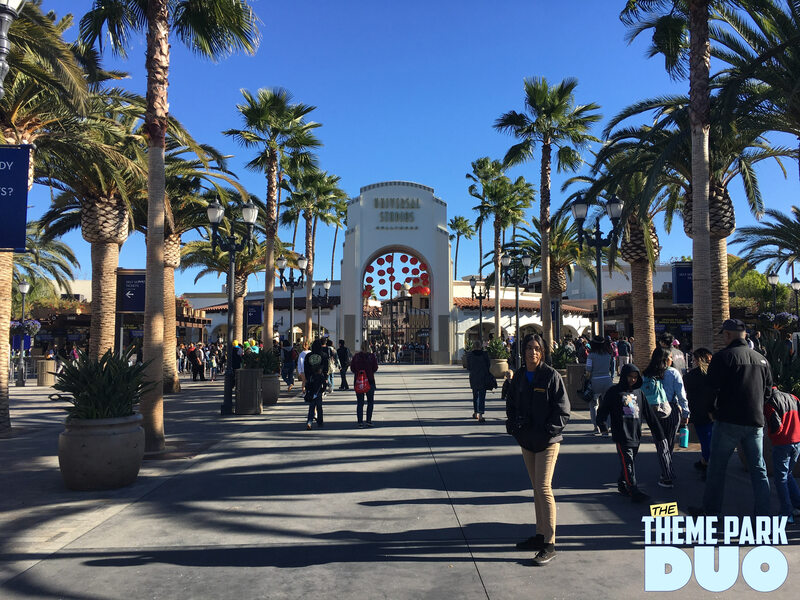 I would have loved for the decorations to spread throughout the main entrance instead of just the arch. But something is better than nothing. Can’t go without including some of the wonderful street entertainment as you enter the park! 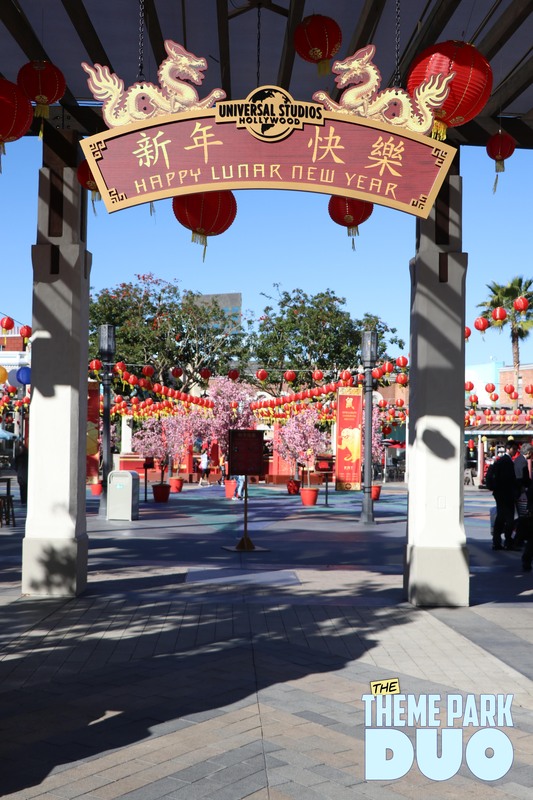 All of the festivities of the Lunar New Year take place in the Universal Plaza. There are so many decorations that I doubt anyone could miss this special event when visiting the park. 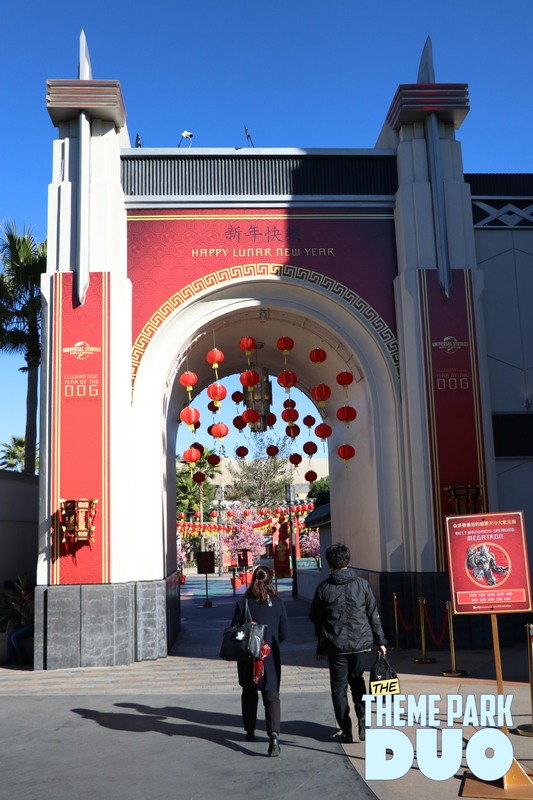 The red lanterns that adorned the entrance are strung above the entrances to the Universal Plaza. As well as over the entire area. The combination of the bright red and yellow lanterns above the beautifully pink Plum blossom wishing trees gave the area new life during the Lunar New Year! 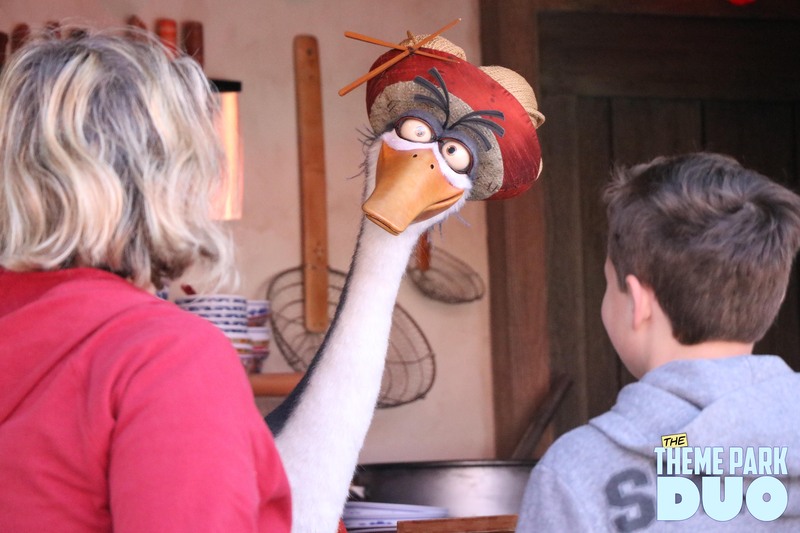 One of the huge draws for myself was the opportunity to meet Mr. Ping! 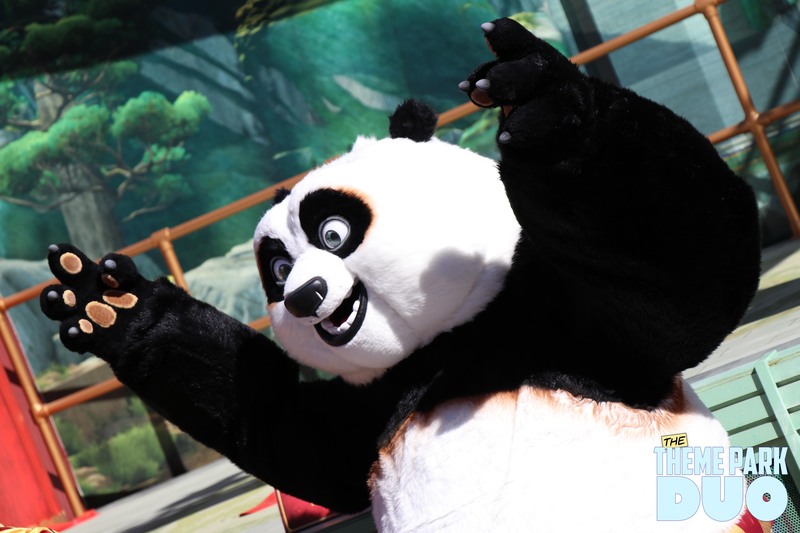 An awesome meet and greet that allow guests at the park to come face to face with Mr. Ping (from Kung Fu Panda) himself! Normally, I am not a huge fan of these types of meet and greets. I always find it so weird interacting with a puppet, but try to play along as to not disappoint anyone. 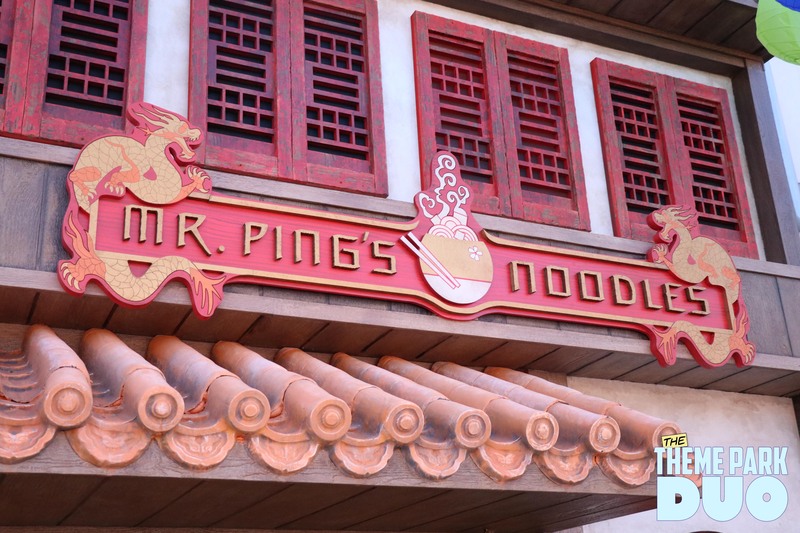 But I found my experience with Mr. Ping very fun! He was funny, quick and knew exactly what to say to entertain you in the few moments you have with him! This was the HIGHLIGHT of the event for me. Off to the left of the Mr. Ping meet and greet is a shop where you can actually BUY some traditional asian food. 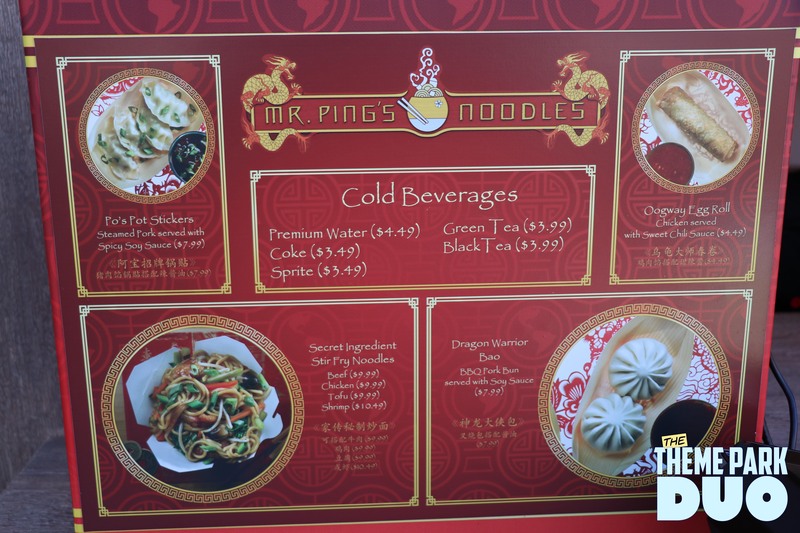 I love how the food that Mr. Ping is selling is ACTUALLY attached to the meet and greet building. It feels very organic to have this here. It is a very small detail, but one that I love. On to the food! 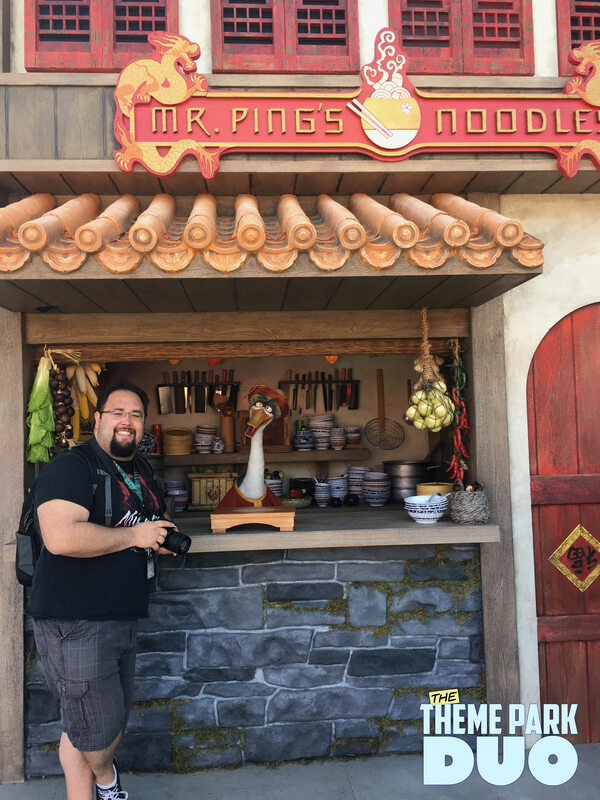 I was lucky enough to try the Secret Ingredient Stir Fry Noodles with Shrimp and the Dragon Warrior Bao! Both of these dishes were a fair price for something rather delicious. This is the quality of food that I have come to expect from Universal Studios. I would love to see this quality make it’s way across the park. 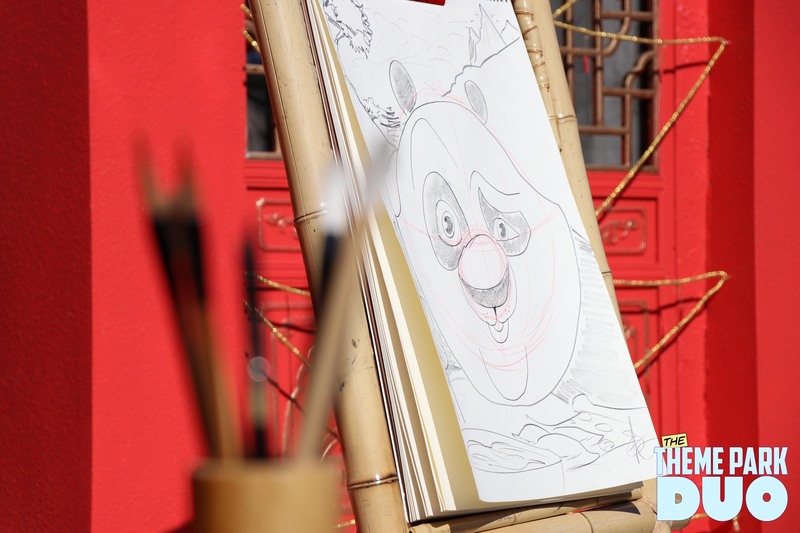 Across the plaza from Mr. Ping is where you can learn how to draw some famous characters from Kung Fu Panda! Throughout the day, you can come back during the designated times and learn how to draw someone different. 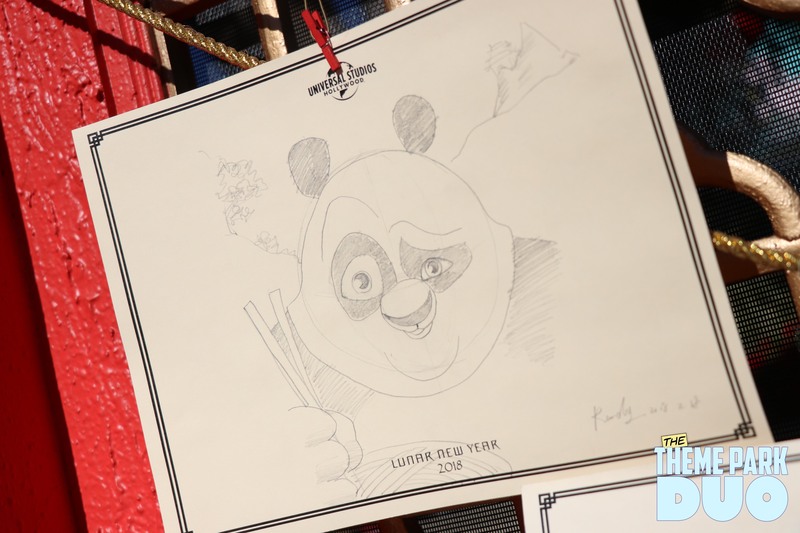 This was very reminiscent of Animation Academy at DCA or Sketch School at Knott’s Berry Farm for Peanuts Celebration, but it was not nearly as polished as those two shows. Unfortunately, the show I saw seemed so rough. The gentleman who was the teacher was setting up his microphone in front of the audience, looking at his phone, and many other things. As opposed to many of the other pieces of entertainment during Lunar New Year, most of the preparation goes on back stage. Unfortunately, there really wasn’t any back stage for this. I think for this to really stand along side competitors versions, it needs to be fine tuned and perfected. There could be a very good chance that I just happen to catch the wrong show and it was a one off situation. 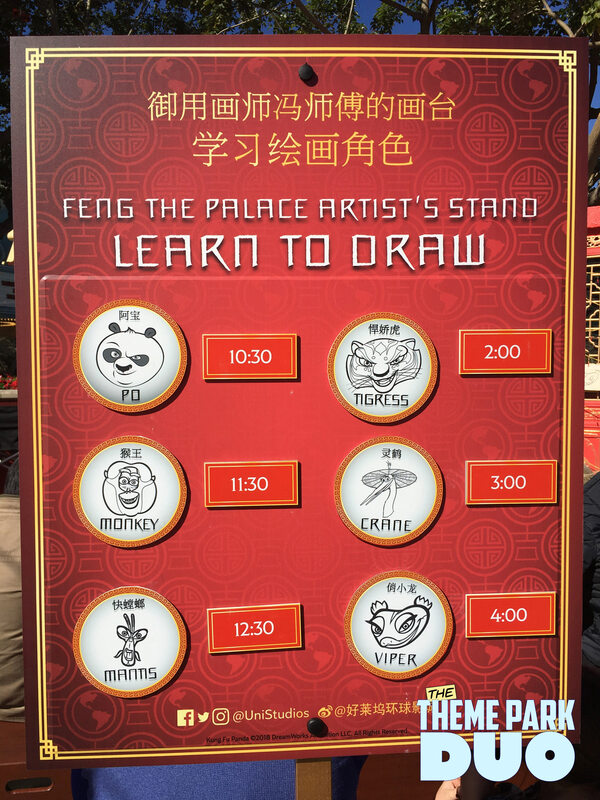 The Dragon Warrior Training Show takes place on the Jade Palace Performance Stage, which sits to the right of the drawing show. When it comes to shows that solely rely on child interaction, it’s a crap shoot! Who know’s what’s going to happen or how the show will play out. But I am very happy to say that this show was nearly perfect in my eyes. 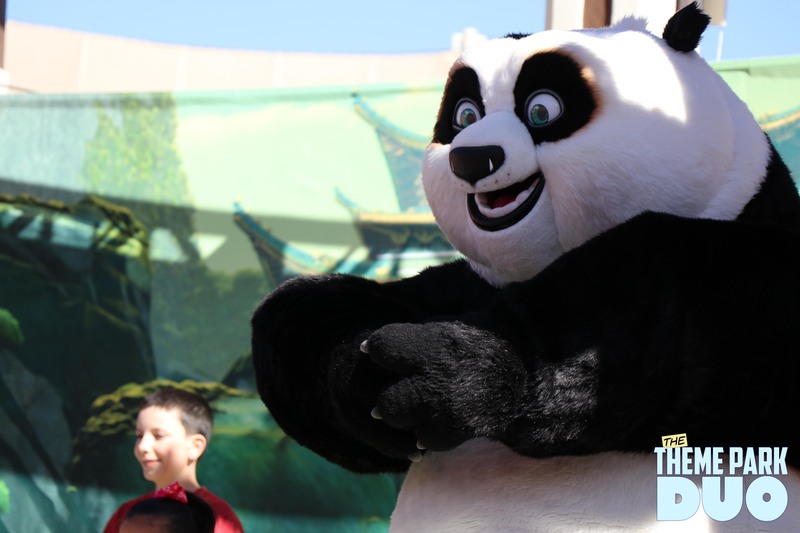 Every single child was unbelievably excited to learn Kung Fu from the Panda himself, PO! The enthusiasm from the kids was really taken to the next level with the wonderful instructors of the show as well. They did a great job getting the kids in the mind set of being a Dragon Warrior. I also found this entire show to be extremely cute as well! 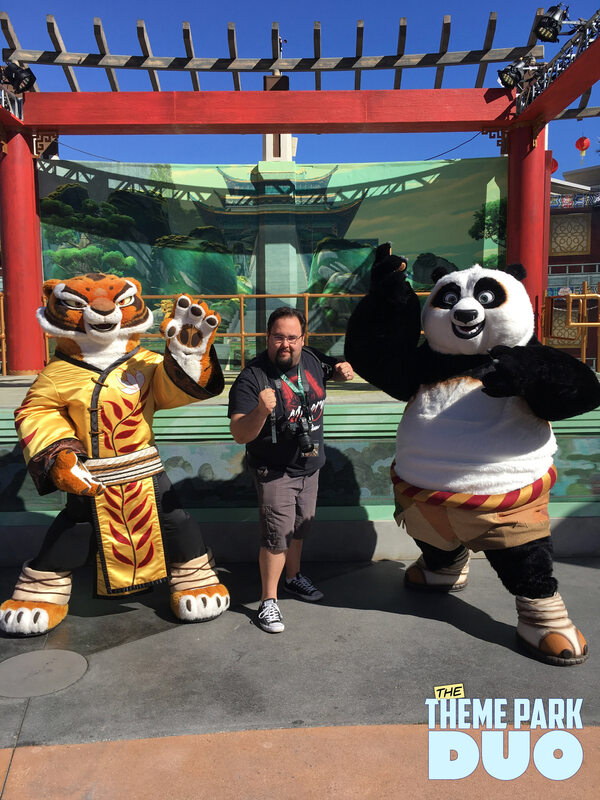 After the show finished, we got the opportunity to meet Tigress and Po! This line filled up fast. A couple things I was not able to experience was Mandarin speaking Megatron, LEADER of the Decepticons! As well as the lovable yellow Minions dressed in Traditional Lunar New Year attire. Now the reason why I wasn’t able to experience both of these pieces of entertainment is simply because the lines were crazy! 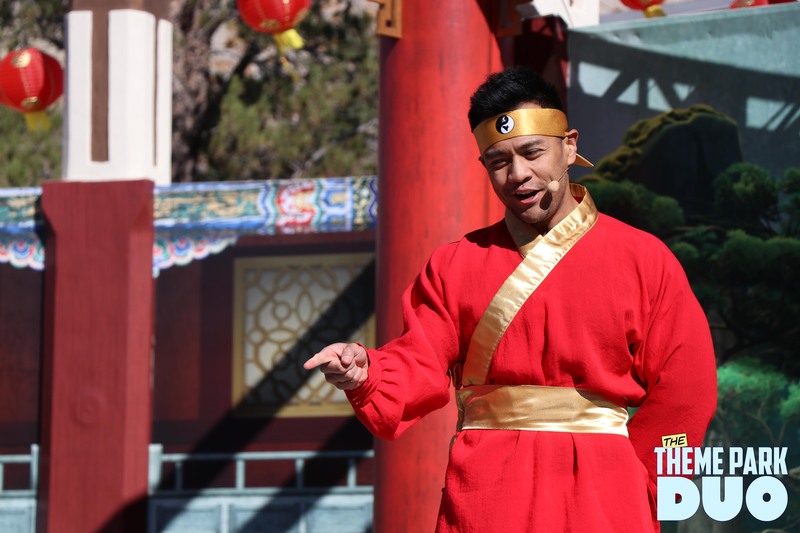 Overall, the newly reimagined Lunar New Year event at Universal Studios Hollywood is incredible fun for people of all ages. 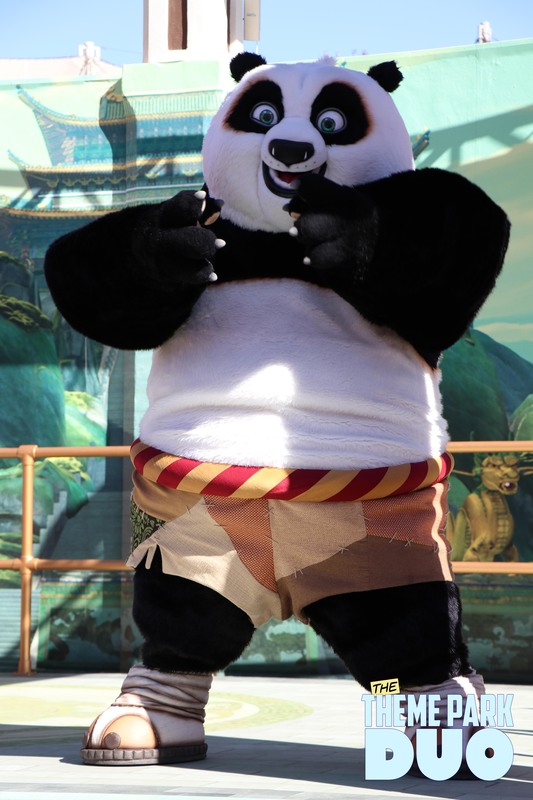 Even though Kung Fu Panda isn’t my favorite Dreamworks film, it was still so fun to actually meet the characters from the film and (to a certain extent) feel immersed in the world. I also really loved the incredible detail work that went into an event that wouldn’t be considered a HUGE main attraction like Grinchmas or Halloween Horror Nights. 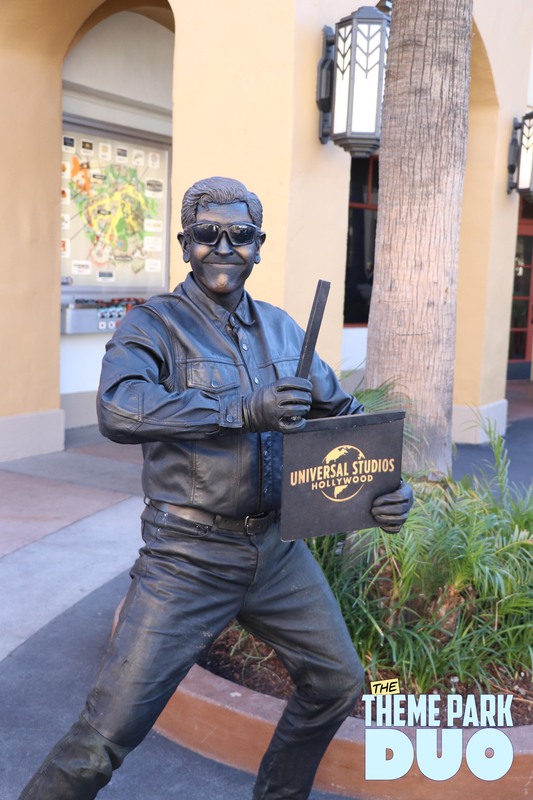 I look forward to seeing how Universal Studios expands and improves on this already great event!